Thanks to last year’s New York Times article revealing the injustice and health hazards of many nail salons, most consumers have been looking for the safest and healthiest manicures out there. Not in Mexico. Apparently, Mexican women are more into challenging their fate and actually opting for an even more dangerous nail experience: The Scorpion Manicure. If you’re thinking that’s some fun name for some extra glitter or new 3D nail art trick, think again. The Scorpion Manicure is true to its name: dead baby scorpions affixed to a nail and sealed with an acrylic polish set under a UV light. The scorpions, which are killed with bug spray, are usually less than a week old, but are still highly poisonous. For reference, the venom from a scorpion can kill a human in 10-15 minutes and some more “mild” side effects can include swelling and accelerated heart rate. Lovely. 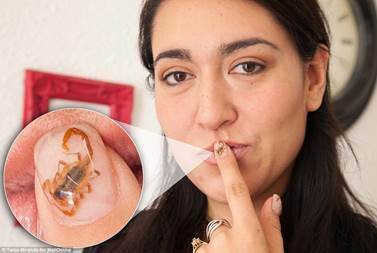 Given that the thought of your typical nail salon-induced foot fungus is enough to make me want to skip my monthly pedi, I think I’ll be passing on the Scorpion Mani. Talk about dying for beauty…or, in this case, not!